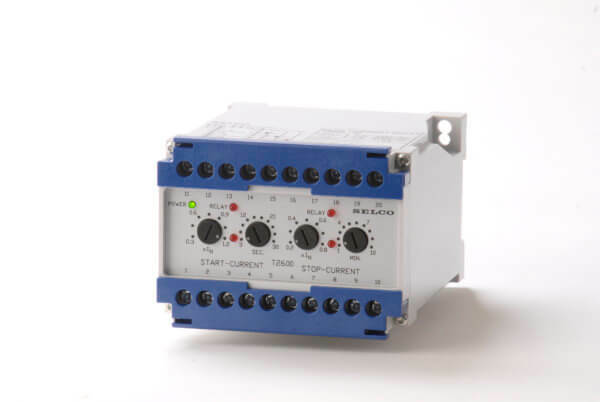 The Dual Current Relay T2600 comprises two current relays. The function of the unit is to start or stop the standby diesel generator according to the load situation. The SELCO T2600 determines load depending start and stop level of the diesel generator. When load increases on the running diesel generators more than e.g. 90% adjustable, for a preset time, a start signal to call for the standby diesel generator will be provided. If the load decreases more than e.g. 45% adjustable, for a preset time, a stop signal will be provided to dismiss one of the diesel generators. The SELCO T2600 can serve an installation with up to three diesel generators. The number of diesel generators can be extended.